NBC5 has hired former network anchor/reporter Vinita Nair as a “special assignments” reporter focusing on extended projects, sources have confirmed to unclebarky.com. The announcement was made Wednesday afternoon to station staffers. Her first day will be on Jan. 29th. Nair, 36, most recently was co-anchor of CBS This Morning Saturday with Anthony Mason, who went on to become interim anchor of the CBS Evening News until Jeff Glor recently was announced as Scott Pelley’s “permanent” successor. In November of last year, CBS replaced Nair on the morning show with Alex Wagner. The Northwestern University graduate, born in Evanston, Illinois but raised in Colleyville, TX, also has co-anchored ABC’s World News Now and America This Morning. In October of this year, she auditioned on the air with co-anchor Ron Corning to become Alexa Conomos’ successor on Dallas-based TEGNA8’s weekday editions of Daybreak. But last week, the job instead went to Kara Sewell, who will be leaving Cincinnati’s WXIX-TV (Fox19) in December and joining Daybreak shortly after Conomos’ last day on Jan. 4th. Monday’s new episode of The Good Doctor continued to provide ABC with a welcome new drama hit and TEGNA8’s increasingly dominant 10 p.m. newscast with a therapeutic lead-in. Good Doc won its 9 p.m. slot in both total D-FW viewers (206,541) and advertiser-coveted 18-to-49-year-olds (71,774). In dong so, it outpointed time slot competition from NBC’s A Very Pentatonix Christmas special, starring the Arlington, TX-bred a Capella group. It ran second in the 9 p.m. hour among the Big Four broadcast networks with 163,808 total viewers and 46,809 in the 18-to-49 age range. NBC’s 7 to 9 p.m. edition of The Voice as usual topped all prime-time programming in total viewers with 235,029, whipping ABC’s competing CMA Christmas special (178,053). But The Voice ran well behind Good Doc for Monday’s top honors among 18-to-49-year-olds. ESPN’s lackluster Monday Night Football attraction, the offensively challenged Baltimore Ravens vs. the offensively challenged Houston Texans, averaged just 185,175 total viewers. TEGNA8’s 10 p.m. newscast, the new sweeps champ, ranked a runaway No. 1 Monday in both total viewers and 25-to-54-year-olds (main advertiser target audience for news programming). Fox4 held serve at 6 a.m. with another pair of comfy wins. The 6 p.m. golds were split between TEGNA8 in total viewers and Fox4 with 25-to-54-year-olds. At 5 p.m., NBC5 and TEGNA8 tied for the top spot in total viewers while the Peacock and Fox4 shared the 25-to-54 spoils. AND THE ‘BOYS PLAYED ON -- The suddenly cratering Dallas Cowboys played three games, all of them lopsided losses, during your friendly content provider’s sojourn abroad. The Sunday, Nov. 12th road loss to the Atlanta Falcons, carried by Fox, averaged 1,082,559 total viewers and 393,196 within the 18-to-49 realm. Atlanta won 27-7. On Nov. 19th, the Philadelphia Eagles’ 37-9 spanking of Dallas on NBC’s prime-time Sunday Night Football stage pulled in 1,189,391 total viewers and 474,331 in the 18-to-49 demographic. Then came the Thanksgiving Day anti-feast, again on the Cowboys’ home field. CBS was the carrier and the Los Angeles Chargers the beneficiary while North Texas fans tried to choke it all down. The Chargers’ 28-6 dress-down of Dallas, which ended at 6:20 p.m., averaged a pedestrian 1,146,658 total viewers and 449,366 in the 18-to-49 motherlode. That’s a massive drop off from last year’s Thanksgiving Day game, which aired on Fox. The Cowboys’ 10th straight win, 31-26 over the Washington Redskins, drew the biggest regular season crowd of the year with 1,941,384 total viewers and 782,532 in the 18-to-49 age range. Seems like ancient history, eh? Beaten a year ago by NBC5 in the showcase 10 p.m. local news wars, TEGNA8 rebounded in the latest November “sweeps” with twin wins in the two key ratings measurements while adding a first-place finish at 6 p.m. in total viewers. Fox4 remained dominant at 6 a.m. with another sweep while NBC5 was strongest at 5 p.m. with an outright win in total viewers and a tie with Fox4 among 25-to-54-year-olds (the main advertiser target audience for news programming). Fox4 prevailed at 6 p.m. in the 25-to-54 realm. CBS11 again emerged with no wins in the four major combat zones. But the station did manage to move up a notch at 10 p.m. in both ratings barometers in a month where World Series run-overs took Fox4 out of the 10 p.m. mix on several nights. Comments: This was a big body blow for NBC5, particularly among 25-to-54-year-olds, where the Peacock went from first to last while losing nearly 20,000 viewers. TEGNA8 in contrast rebounded from second- and third-place finishes, and joined CBS11 as the only stations to show audience increases in both ratings measurements. CBS11, which had been in a ratings desert with 25-to-54-year-olds, can be particularly cheered by a 14,118 viewer bump-up from the previous year. But TEGNA8 clearly is the big winner here after the dispiriting results of the November 2016 sweeps, in which the station lost more viewers than any of its rivals. Comments -- Fox4 remains the rajah of the rising sun, with no other station seriously challenging its dominance in these latest sweeps. The 7 to 9 a.m. portion of its Good Day also continues to pay big dividends by beating all three network morning shows. TEGNA8 had a bright spot with the biggest year-to-year increase among 25-to-54-year-olds during the first full month of its revamped, social media-heavy Daybreak. Time will tell whether it eventually proves to be a turnoff or tune-in. Comments: As at 10 p.m., this was not at all pretty for NBC5, which notched two firsts last November but suffered the biggest audience decreases this time around. The newly crowned winners, TEGNA8 and Fox4, also respectively showed the biggest increases while Fox4 and CBS11 also had nice boosts in total viewers. Postscript: Overall, the four combatants logged as many year-to-year audience gains (16) as losses this time around. It was markedly different in Nov. 2016, when the minuses crushed the plusses by a score of 27 to 5. TEGNA8 led the way with plus marks in six of the eight competitions in the 2017 sweeps while NBC5 was the loss leader with just one year-to-year audience gain. After a nearly year-long, stop-and-go search, TEGNA8 has hired Kara Sewell to replace Alexa Conomos as co-anchor of the Dallas-based station’s weekday editions of Daybreak. There’s been no official publicity release from station management yet. But Sewell, who’s anchored early mornings at Cincinnati’s WXIX-TV (Fox19) for the past three years, confirmed the move on her Facebook page after veteran Cincinnati TV critic John Kiesewetter broke the news on Thanksgiving eve. Kiesewetter’s a fan. “This doesn’t surprise me . . . She’s that good,” he wrote. Conomos, in a Nov. 16th Facebook post, did not name her successor, but did say that her last day on Daybreak will be Jan. 4th. As previously reported on unclebarky.com, Conomos originally informed TEGNA8 of her departure plans in January of this year, and had planned to leave the station after the May “sweeps” ratings period to have a more “normal” life with her husband and their three young children. But station management kept persuading Conomos to extend her stay while various applicants auditioned with incumbent co-anchor Ron Corning. They included both TEGNA8 news staffer Sonia Azad and former CBS This Morning co-anchor Vanita Nair. Her last day at the Raycom Media-owned WXIX-TV will be sometime in December before she makes her Daybreak debut in January. Sewell said she had no problems with WXIX, but wanted to seize the opportunity to return to her native state of Texas. She’s a Stephen Austin State University graduate who began her TV news career at Midland-Odessa’s KOSA-TV after interning at KRTK-TV in Houston. Before joining WXIX-TV, she worked the morning shift for six years at KWCH-TV in Wichita, Kansas. Her move also is a significant market jump, from No. 35 Cincinnati to No. 5 D-FW. Sewell told her Facebook fans that she’ll be “on social media constantly” as a way to stay in touch. This is in keeping with TEGNA8’s recent major push in that direction, with Daybreak the principal incubator. Two other new hires, traffic reporter Demetria Obilor and “social media anchor” Janelle Brandon, likewise are heavy users who both have their own Twitter/Facebook segments within Daybreak. Corning isn’t exactly an oldster and is adept at being off-the-cuff glib. But at age 46, he’ll be something of a Charlie among three significantly younger angels on the new look Daybreak. He’s lately gone tieless in keeping with the show’s rapidly evolving makeover. In the most-watched 6 to 7 a.m. portion of DFW’s early morning news programs, Daybreak remained in third place during the just concluded November ratings “sweeps” in both total viewers and the key news demographic of 25-to-54-year-olds. Fox4 is still No. 1, followed by NBC5. But TEGNA8 gained viewers from last November in both ratings measurements, as did frontrunner Fox4. NBC5 was up year-to-year in total viewers but drew fewer 25-to-54-year-olds than it did in November 2016. Unclebarky.com is taking some time off while its proprietor goes on a big adventure. Thanks to all readers for your continued patronage, and be assured we’ll be back up after the Thanksgiving weekend with the November “sweeps” local newscast ratings results for starters. NBC’s latest two-hour edition of The Voice continued to hit ratings high notes Monday. Averaging 256,396 D-FW viewers from 7 to 9 p.m. the competition to crown America’s latest future singing unknown ranked as prime-time’s top attraction. ESPN’s Monday Night Football matchup between the Green Bay Packers and Detroit Lions finished first with advertiser-prized 18-to-49-year-olds, though, pulling in 84,256. MNF averaged 227,907 total viewers for the entire game, matching the haul for ABC’s Dancing with the Stars. Within the Big Four broadcast network universe, Fox4’s local newscast otherwise took the 9 p.m. hour in both ratings measurements, with 156,686 total viewers and 56,171 in the 18-to-49 realm. Fox4 and TEGNA8 won all the spoils in the four major four-way face-offs. TEGNA8 won at 6 and 10 p.m. in both total viewers and 25-to-54-year-olds (main advertiser target audience for news programming). And Fox4 ran the table at 6 a.m. and 5 p.m. The Dallas Cowboys controlled the potent Kansas City Chiefs Sunday in their first regular season game on CBS11. D-FW viewership remained strong for the second straight week after a falloff for the team’s wipeout two weeks ago of the inept San Francisco 49ers. Running until 6:21 p.m., the Cowboys’ 28-17 win averaged 1,253,490 viewers and 471,211 in the advertiser-coveted 18-to-49 age range. That’s a marginal drop off from the 1,289,100 viewers for the previous Sunday’s road win on Fox versus the arch rival Washington Redskins. That game had 514,899 viewers in the 18-to-49 realm. Sunday Night Football’s attraction on NBC, Raiders vs. Dolphins, had 334,739 total viewers and 121,704 within the 18-to-49 demographic. CBS’ 6:30 p.m. edition of 60 Minutes, given an extra lift by the Cowboys’ lead-in, had a prime-time best of 555,524 total viewers. On Saturday, ESPN’s prime-time TCU-Texas game led the college football parade with 199,419 total viewers. The increasingly woeful Dallas Mavericks’ loss at Minnesota, airing opposite TCU-Texas, went about as low as one can go with 2,849 total viewers on Fox Sports Southwest. Sadly, that’s not a misprint. CBS’ Blue Bloods as usual led all Friday prime-time attractions in total viewers with 163,518 while NBC’s two-hour Dateline was tops with 18-to-49-year-olds (56,171). Thursday’s 9 p.m. premiere of CBS’ S.W.A.T. narrowly won its time slot with 135,320 total viewers compared to 128,198 for NBC’s competing Chicago Fire. S.W.A.T., Chicago Fire and Fox4’s 9 p.m. local newscast tied in the 18-to-49 realm with 34,327 viewers each. CBS also rolled from 7 to 9 p.m., particularly with a new episode of The Big Bang Theory (a night’s best of 405,960 total viewers) followed by the return of its spinoff, Young Sheldon (348,983). The network’s Mom and Life In Pieces also won their slots in total viewers. In the key 18-to-49 measurement, only Mom stumbled, running third from 8 to 8:30 p.m. behind the first half-hour of Fox’s The Orville (just renewed for a second season) and NBC’s Will & Grace. Thursday -- TEGNA8 nipped CBS11 for the most total viewers at 10 p.m. while Fox4 won among 25-to-54-year-olds (main advertiser target audience for news programming). Fox4 had twin wins at 6 a.m. and TEGNA8 likewise swept the 6 p.m. competitions. The 5 p.m. golds went to Fox4 in total viewers and NBC5 with 25-to-54-year-olds. Friday -- CBS11 this time claimed the top spot in total viewers at 10 p.m., but Fox4 again ran first with 25-to-54-year-olds. Fox4 ran the table at 6 a.m., while TEGNA8’s new “social media”-heavy Daybreak fell to fourth in total viewers (just a bit behind CBS11). Those latter two stations tied for the bottom rung with 25-to-54-year-olds. NBC5 swept the 6 p.m. races and Fox4 had twin wins at 5 p.m.
LOCAL TV NEWS NOTE: -- OK, this is like juggling with hand grenades. But here are some carefully chosen words on the social media “firestorm” and “worldwide crusade” (TEGNA8’s on-air words) tied to new Daybreak traffic anchor Demetria Obilor’s video response to a woman, Jan Shedd, who said on Facebook that Obilor looked “ridiculous” in attire that, in her view, fit her way too tightly. Shedd has been used as Exhibit A by TEGNA8, with only her highly critical post displayed on the air. But the station says that Shedd was merely the tipping point after a number of social media posts had “body-shamed” Obilor, who joined Daybreak on Monday, Oct. 23rd from KLAS-TV in Las Vegas. A steady stream of Tweets, all effusively praising Obilor, were scrolled on the bottom of home screens during this segment while Corning also showed a video from his church pastor, whom he said commended Obilor during her sermon Sunday. Your friendly content provider posted a critique of the new “social” whirl enveloping Daybreak after watching the 4:30 to 7 a.m. entirety of the Oct. 25th edition. It focused on content and made no mention at all of Obilor’s choice of attire. I will say, however, that TEGNA8 arguably could be seen as unduly milking and overblowing this “controversy” in hopes of luring more eyeballs and juicing Daybreak’s ratings just a little. The show currently ranks third in the most-watched 6 to 7 a.m. hour behind Fox4 and NBC5. It also should be noted that more than a few viewers are critical of Obilor’s attire because they don’t consider it “professional.” That’s an old and probably outmoded way of thinking when it comes to today’s local television news. But an unclebarky.com reader, whose name will be left out of this to spare him being attacked as a sexist, a racist or worst, makes sense on at least some level with this email. As for myself, I’ll continue to focus on Daybreak’s content, and debated whether to even address this so-called “controversy.” Obilor is still new in this market, and deserves a chance to make her mark. She obviously won’t be shy about trying to do so on a station that almost begs viewers to interact with its newscasts via various forms of social media. I wish they’d give that a bit of a rest, but they won’t. I also wish Demetria Obilor the best in what’s still a very new adventure for her. A second consecutive seven-game World Series again made Fox’s baseball investment pay off handsomely Wednesday. Although lacking the thrills and drama of Chicago Cubs’ extra-inning win over the Cleveland Indians, this year’s first-ever Houston Astros world championship likewise was a gift that kept on giving. In fact, it outdrew Game 7 of Cubs-Indians in total D-FW viewers. 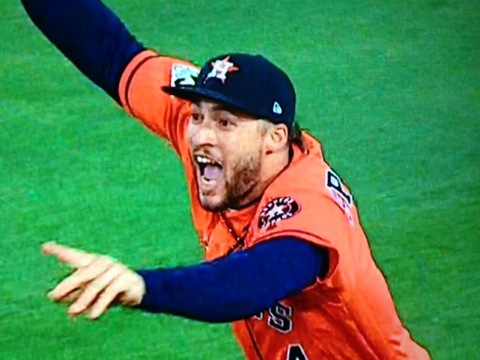 The Astros’ 5-1 win over the Los Angeles Dodgers, in which they again pummeled former Texas Ranger Yu Darvish, averaged 861,774 D-FW viewers and 343,266 in the advertiser-coveted 18-to-49-year-old demographic. The game ended at 10:59 p.m., and these numbers reflect the actual running time. Last fall’s Cubs-Indians finale pulled in 792,550 total viewers and 368,817 in the 18-to-49 age range. The Cubs won 8-7 to claim their first world championship in 108 years. Astros fans had waited the entire existence of the franchise -- since 1962 -- for their team’s first crown. They were birthed as the Colt .45s, a name that lasted for three seasons. Among programs scheduled entirely opposite Game 7 of Astros-Dodgers, ABC’s 8 p.m. episode of Modern Familiy was Wednesday’s runner-up prime-time attraction with 142,442 total viewers. TEGNA8 won a downsized 10 p.m. race in total viewers while CBS11 ran first with 25-to-54-year-olds (main advertiser target audience for news programming). NBC5 scored twin wins at 6 a.m. and TEGNA8 ran the table at 6 p.m. The 5 p.m. competitions produced another sweep, with Fox4 twice topping the charts. Matt Howerton and Cleo Greene being added to TEGNA8 news staff. TEGNA8 has hired Cleo Greene as its new weekend Daybreak anchor/reporter. She’ll start on Jan. 25th after arriving from Minneapolis’ ABC affiliate, KSTP-TV. The Dallas-based station also is adding Matt Howerton to its reporting staff. He’ll begin on Nov. 20th and most recently has been with Albuquerque’s KOAT-TV, also an ABC station. TEGNA8 news director Carolyn Mungo announced both hirings Wednesday afternoon in a staff memo obtained by unclebarky.com. Greene has been with KSTP since February 2015. The search continues for a weekday Daybreak co-anchor after Alexa Conomos announced her intention to leave the station back in January of this year. Management since has persuaded her to keep extending her stay while her eventual replacement hangs in the balance. Earlier this fall, both staff reporter Sonia Azad and former CBS This Morning co-anchor Vanita Nair received on-air tryouts with incumbent weekday Daybreak co-anchor Ron Corning. Previous stops for Greene include WBOC/Fox21 in Salisbury, MD and WRDW-TV in Linwood, NJ. The 2008 Rowan University graduate also has interned for WCAU-TV in Philadelphia and with Cosmogirl magazine. Howerton, who lately also has been doing weathercasts for KOAT, is an Ennis, TX native and 2012 Baylor University graduate who interned at TEGNA8 during his college years. He joined KOAT from KWTX-TV in Waco and also has interned with New York City’s WABC-TV.